Listening to your favorite running songs can give you a boost of energy or motivation to power through to the end. But is it a good idea to always listen to music on the run? Consider the benefits and drawbacks of running with music, and then get some inspiration for your running song playlists. Many runners find that listening to music is an excellent strategy for battling boredom during runs. And if you think you get a little extra pep in your step when you're listening to high-energy music, you're not imagining things. Studies have shown that listening to music can boost athletes' speed. One study found that listening to fast-paced music especially improved performance in the beginning and end of a workout. However, it's worth keeping in mind that research looking at music and performance has been done in labs with inexperienced athletes, not under real racing conditions. (It may be easier for music to invigorate a subject under low-excitement conditions such as doing a time trial in a lab.) 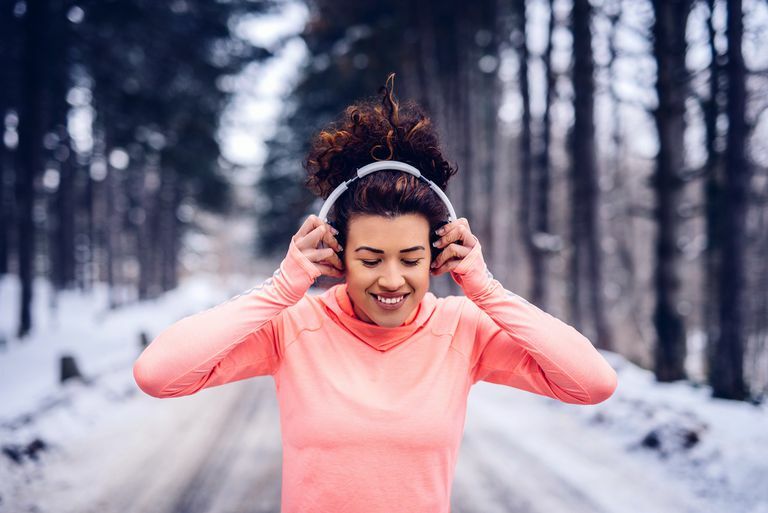 Runners in a real race are likely to already have their adrenaline pumping, thanks to the excitement of a race, so they may not necessarily need the extra stimulation of music. Of course, running with music does have its disadvantages. One downside is that your cadence may be off, as you'll likely speed up and slow down based on the tempo of the music. That's fine if you're doing a run when you don't care too much about your pace, but it can be a disadvantage when you're trying to pace for a specific workout or race. Some races may not allow headphones for safety reasons. Even if the race doesn't ban them, it still may be a good idea to not wear them because you may not be able to hear instructions from race officials and other runners on the course. Another warning about wearing headphones during a race is that you'll miss out on a lot of the race fun and excitement. You won't be able to listen to bands, hear people cheering, or talk to other race participants. There's also a chance that your music listening device (say, your cell phone) could stop working during your race, so it's important that you don't get totally dependent on it. If you rely on your tunes to keep you moving, but your phone gets wet and dies during a race, will you still be able to hit your goal time? Most importantly, when running outside, your music may block noise from oncoming cars, cyclists, other runners—even unfriendly dogs. One of the basic etiquette rules of running is that you can hear others, so you can move out of the way or stop, when necessary. For safety and courtesy when listening to music while running outdoors, keep the volume very low or keep one earbud out. It can be best to save your running songs for the treadmill, where you may need the extra distraction to avoid getting bored. Fortunately, some research shows that you can still get some of the benefits of listening to high-energy music even after you’ve listened to it. One study found that listening to high-tempo music during a 10-minute warm-up led to better performance in high-intensity exercise, even when there’s no music playing during the exercise itself. So, if you're worried about safety or you don't want to wear (or aren't permitted to use) headphones during a race, you can imitate those Olympic athletes who listen to some high-energy, motivating songs during their pre-race warm-ups. You'll get most of the same benefits as you would if you listened to it during the race. If your running music needs a refresh, browse through these song playlists to get some new ideas. Top 40 hits and pop music and are popular categories for running songs. The hip-hop/rap genre is another very popular category of running music. Hip-hop and rap songs usually have a great beat and are very versatile, so they can be used for hard workouts as well as slow, easy runs. Here are more running songs playlists. Edworthy, J.; Waring, H., The effects of music tempo and loudness level on treadmill exercise. Ergonomics 2006, 49 (15), 1597-1610. Jarraya, M.; et, al. The Effects of Music on High-intensity Short-term Exercise in Well Trained Athletes. Asian Journal of Sports Medicine 2012, 3. Mohammadzadeh, H.; et. al., The effects of music on the percieved exertion rate and performance of trained and untrained individuals during progressive exercise. Physical Education and Sport 2008, 6 (1), 67-74.